just in time for Labor Day too. I am sewing the first border and when I get it to a complete flimsy..
and maybe provide a tute? pictures will follow over the next days. 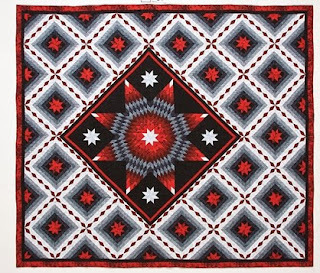 Star Struck Quilts includes complete instructions for 9 wall hangings, which can then be transformed into 27 bed-sized quilts. 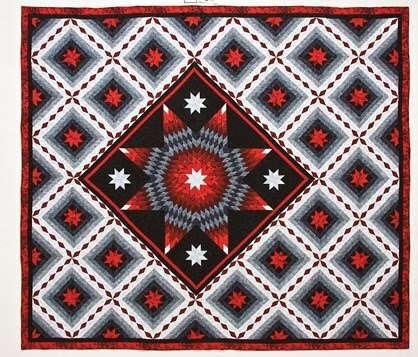 Barbara shares many valuable life lessons and shows you how to achieve the fine workmanship found in the quilts made in her Mennonite community. Be sure to visit them all for a chance to win the Star Struck Quilts book and a few other quilt goodies! As my part of the blog tour, I was able to ask Barbara a few questions. First Question: 1. You have included many life lessons in your new book Star Struck Quilts, can you tell me a life lesson that you feel is important but didn't make the 'cut' for the book? I have many happy memories of my family playing a competitive card game, Rook, in my growing up years. When Terry and I dated and then married, I learned that he was a “Rook Pro” who took the competition to another level of being serious about the game. One evening, Terry and I were among a group gathered at his parent’s home to enjoy the evening with this card game. As I sat by his side and observed the proceedings I realized that he was perturbed because he was losing. This seemed childish to me, since it was only a game. With a few unseasoned words, I let everyone know what I thought of his behavior. As I sensed a wall growing between us, I scooted closer to Terry supposing this would absolve the tension. This proved to be the wrong maneuver as the wall continued to grow throughout the evening. Later when we were able to discuss the situation, I realized that I had humiliated my husband in front of his family. lesson was to honor my commitment to love and respect my husband. LESSON: Always Honor, love and respect my husband. Second: Do you have a favorite color? Barbara: I can't come up with a favorite. I just love the beauty in colors and how pretty they are when different value, shades and tones are placed together to enhance each other. Third: I have many readers that are beginner quilters. Do you have any advice you could share with a new or beginner quilter? Take classes, read books and magizines on the subjects of quilting. Try to learn new tecniques. Don't say "that is to hard for me". Keep in mind that you learn by taking little steps with each quilt you piece. After I finish a quilt I still look at it and see where I could have improved on it. I don't look at this as a failure but as a learning step for the next quilt. I hope you enjoyed Barbara's blog tour! 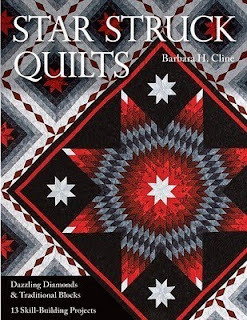 If you'd like to win a copy of Star Struck by Barbara Cline or the group of her favorite quilting notions, please leave a comment on this post and I will choose a winner on September 2nd using the random number generator. First place winner will receive a copy of Star Struck Quilts; 2nd place winner will receive a gift set, including the pictured items above: pen-style Chaco-Liner, Flower Head Pins and Mary Ellen's Best Press spray. Along with the other blogs participating, I will also draw a 3rd name which will be forwarded to Barbara for an opportunity to win some RJR fabric or a $25 gift card to Patchwork Plus (Barbara's local quilt shop), and winners for those prizes will be announced on her blog here. Beginning August 23rd C and T Publishing is sponsoring a blog tour to promote the new book Star Struck by Barbara Cline. There will be stops on the tour with a chance to win a copy of the book at each one! I lost track of the days and it dawned on me today that I had past the 23rd for my announcing post! Work HAS been taking it's toll. whew. Be that as it may..I am here now to announce this blog tour and stop back to my blog on the 29th for my part of the giveaway! I purchased a bundle of Pure at quilt market. I have no real plans for it. I was kinda hoping that some super creative quilter designer would make a quilt for my inspiration. So one day about 3 weeks or so ago, I was blog hopping. One to the next with no real end in site. I found this blog. This creative quilter Christine paired orange with Pure charms. I thought "wow, that's a great idea". I mentally filed it and moved on. While I was in Amish country with my friend Carol on the 6th, she and I were talking and I said that I wanted to find an orange to pair with Pure. We were rummaging through a 1 yard for $4 bin and I picked up this orange with red circles. I told Carol, this is what I think will work. and I find this cool quilter that paired orange with Pure. well it's the exact same as the orange I picked up in Charm. It must have made quite an impression on me. I don't think I could pull that off twice, ever! I didn't intend on using the same orange. This one just 'fit'. I'll let you know when I decide LOL. There was some non-fabric crafting last weekend by my 4th grader. She creatively made a Peace sign for every month. Holiday themes were important for her. March is her favorite month..hence the St. Patty's Peace sign. I am just glad she is making items here and there. Here's a snippet of the awesomeness I found at JEllen's. Fandango! lots of Fandago pre-cuts, yardage wasn't in yet. On top of that I bought 3 different colors of giant rick rack. I could have bought every color she had but I don't really a plan for them. And there was some Wee Woodland. I chose the stripes because I thought they could mix in with so many other lines. So they were stash enhancers. And my most favorite find was Haunted Mansion by Sanae. I had seen this line online a couple of months ago and thought 'ehhn' not that great. Then I saw it at JEllen's, I wanted to buy a whole bundle. She didn't have bundles..just charm packs and some yardage. So I picked a few yards and some grey bella solid too. I have already started working on a design with it. I have a list a mile long of Halloween and Autumn projects. I just had a jolt of excitement. With work as hectic as it is and being completely whipped each night, I might not get to sew until Friday. Ah I finally have the pictures loaded from my fun Saturday! I had the pleasure of attending a short business meeting in Solon, Ohio. A bit after that I made my way up to Lyndhurst, Ohio. There is a brand new quilt shop there called JEllen's House of Fabric. It was the finale to her Grand Opening week. If you don't know the story of JEllen or her lovely daughter Sarah, you can read a bit on Sarah's blog, Kate's blog or Joyce herself. From the outside, the first display was all Frolic. There was definitely a great deal of time and planning in all the decor. I was floored by the beauty. The notions and basics room. Giant rick rack, latest books and simple notions. The entrance, you can see Fruitcake and 12 Days of Christmas. Some baby colors and basics in this corner. Did I mention the decor? no, but I'll take a Moda cracker please. And of course, there was Sarah, and Kate Spain. Kate Spain is a Moda fabric designer of the Verna, 12 Days of Christmas and Fandango fame! When Kate arrived everyone flocked to her. She was the celebrity of the day after all. She had a sweet meeting with Sarah and gave her a cute little Verna bag with goodies. And of course, I chatted with Kate too. I have met Kate twice before at quilt market. This was different. I was fortunate to meet her husband Pete this time. I quickly realized how awesome our husbands are...my husband stayed with my girls so that I could travel 75 miles for my meeting and go to a quilt shop! Kate's husband traveled to meet everyone and be supportive, and JEllen's hubby and son were on sight for this occasion. You could see the pride and joy that they felt that their mom/wife had opened her own quilt shop. I just met them and I felt pride too, and joy for them. The support of their other family and friends was very evident. With little competion for Kate's attention ( well not as much as market, I should say), we chatted a bit. She's every bit as sweet as her smile. She and I chatted about quilting things, the industry and we chatted it up with Moda Mark, the rep for Ohio. I love to hear his take on the industry. Yes, I am saying "industry". Once you go to quilt market...you quickly realize the business side of quilting. But that's a deep subject for another blog or maybe never. Anyhow, the shop owner's landlord brought her this AMAZING cake. yep, it's cake, with fondont. So while others were chatting with Kate and Pete, I shopped for fabric, ah what else is there? I have pics of the fabric I picked up. Hopefully I will be able to load pics and show you some tomorrow.